As anti-whaling day unfolded people around the globe stood up and spoke out about saving the whales. Today scientists have proven that cetacean brain size is equal to that of man’s, and that in some ways whales and dolphins maybe even more intelligent.“Bottlenose dolphins have convincingly demonstrated that they use a mirror to investigate their own bodies, showing that they have a sense of self (Reiss and Marino, 2001). These findings are consistent with further evidence for self-awareness and self-monitoring in dolphins and related cognitive abilities (see Marino et al, 2008, for a review). In particular, the highly elaborated cingulate and insular cortex in cetacean brains are consistent with the idea that these animals are highly sophisticated and sensitive in the emotional and social-emotional sophistication not achieved by other animals including humans. All of the above factors provide cause for concern over the vulnerability of whales and dolphins when placed in stressful situations, including capture, drive hunts, and the disruption of social networks. Moreover, conservation measures that do not take into account the psychological complexity of these animals will do little to alleviate suffering on an individual level. Beyond our scientific understanding, our current knowledge of cetacean brains and cognitive abilities demands we develop a new ethic of respect and coexistence with them” (Phillip Brakes and Mark Peter Simmonds, Whales and Dolphins Cognition, Culture, Conservation and Human Perceptions, Washington, DC, Earthscan, 2011). With all of the science supporting dolphin intelligence, and love for dolphins worldwide it makes the daily slaughter of our brothers and sisters of the sea seem so distorted and out of step with the rest of the world. Activists cannot help but wonder what drives these men on day after day as they pick up their knives, harpoons and bamboo nails only to hide behind their tarps where they dominate, and destroy our ocean friends with such cruel intent. The dolphin hunters have gone to great lengths to hide their killing activities yet this year more footage of the killing cove itself was obtained from a concerned citizen of Taiji undoubtedly afraid to speak out. http://soundofcritters.com/archives/1543 This year the killers have built walls so the watchful eyes of the world cannot see the beloved dolphins die a slow death lasting 7 minutes or more. Thanks to activist Dieter Hagmann the world now knows how sadistic and horrific a dolphins last moments are in the killing cove. “Waters run red in the cove, not sure of the numbers but up to 10 risso’s dolphins have lost their valuable lives in Taiji today. My heart flies at half mast, how much longer do we have to endure this barbaric nature. 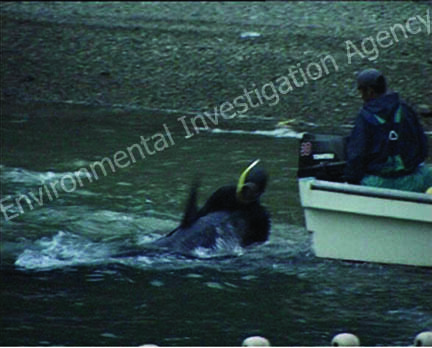 We will run out of dolphins before they will stop but we must continue this valuable fight”. 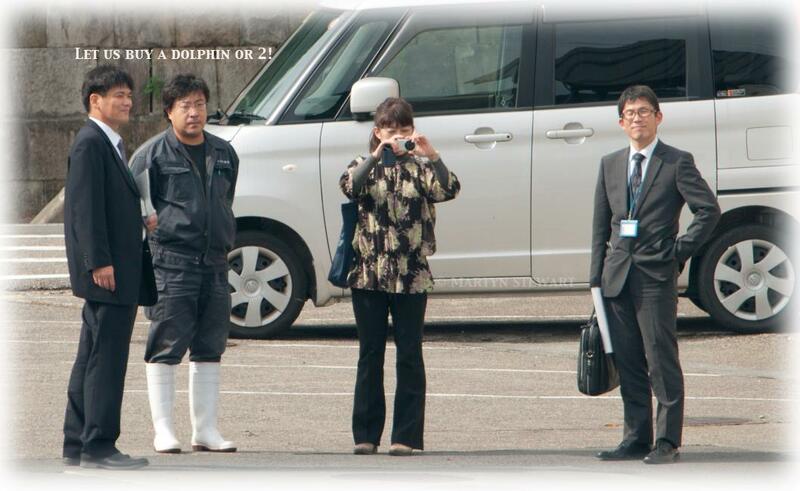 The small group of activists on the ground bravely bare witness to the pain and suffering of the dolphins. Activists are calling for more volunteers on the ground in Taiji. They need your help. Do you have what it takes to join this movement and stand up for the dolphins in Taiji? 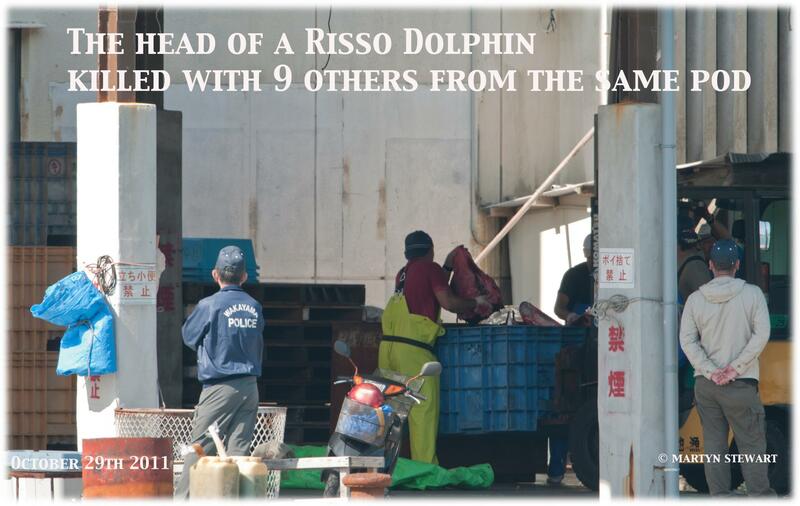 Since the dolphin slaughter began September 1st approximately 91 Risso Dolphins have been slaughtered in The Cove. They are one of the dolphin species that has insufficient data about their populations. This season several mothers and babies have been brutally slaughtered. 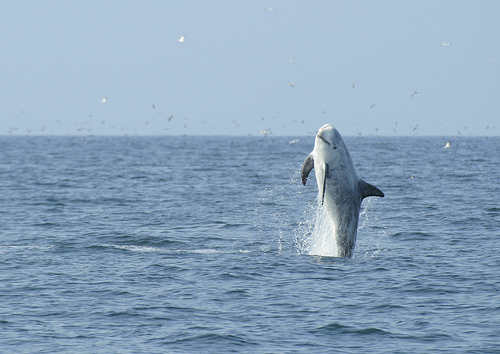 Risso female dolphins have babies less often than humans. They carry their babies for 12 months and their babies stay at their mothers side for many years to learn social, and hunting skills. The dolphin hunters have no mercy for mothers or babies. 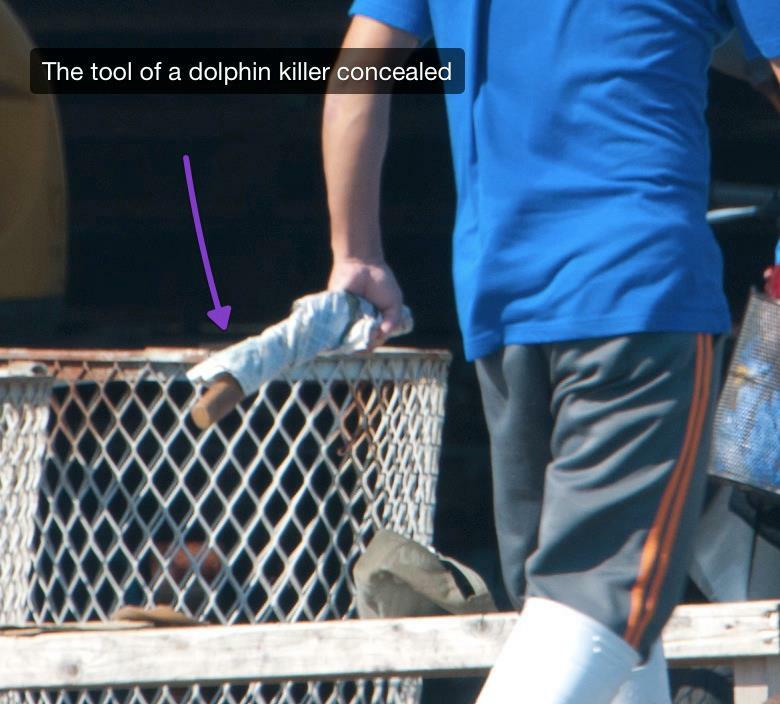 The dolphins are forced under the blue tarps of shame where even children meet a gruesome death at the end of their sharp knives. Their’s is a sadistic cruelty, a desire to dominate, and destroy that is rarely seen or understood. 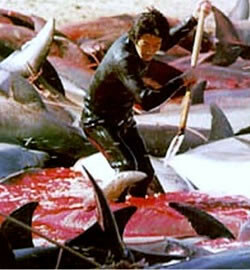 How long these killing will continue depends on several factors the most important being the captive dolphin industry. For every thousand killed 100 are sent to dolphinariums worldwide. Aquariums, swim with dolphin programs, and places like SeaWorld may seem benign but in fact they keep the vicious cycle of slaughter going as live dolphin trade continues to grow. Take Action! Get active through social media, spreading the word, contacting embassies, and participating on Dolphin Awareness day September 1st. Tell your friends and family about the movie, “The Cove”, http://topdocumentaryfilms.com/cove/ and “A Fall From Freedom” http://afallfromfreedom.org/view-movie. Also, to learn more read Hardy Jones, “The Voice of Dolphins” learn more about the dolphin drives and the Mercury and PCB’s in the dolphin meat http://www.amazon.com/Voice-Dolphins-Hardy-Jones/dp/1456377531/ref=sr_1_1?s=books&ie=UTF8&qid=1320549260&sr=1-1. We must convince Taiji and the world that the dolphins have a right to travel by Taiji safely without fear of being dragged to their deaths into the blood cove. Dolphins have a right to be free. 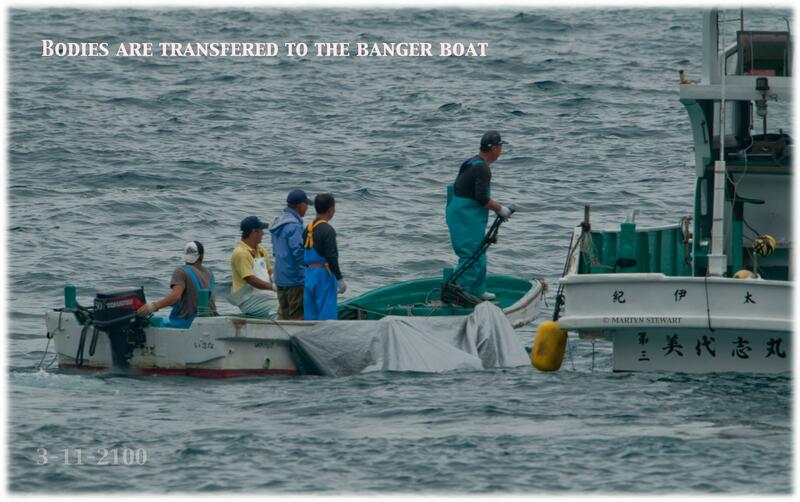 Not everyone in Taiji supports the drive fisheries it is actually a small group of 26 fisherman and 13 boats. We must keep fighting to save the people of the sea before it’s too late for cetaceans, and our oceans. How can you not see the sensitivity and depth in the eyes of the minke whales. The minke is shy, and rather elusive weighing up to 14 tons. As the smallest of the baleen whales, the minke is a filter feeder dining on krill, and small schooling fish like cod, and pollock. They are fast swimmers,swimming up to speeds of 24 mph. They reach maturity at 7 or 8 years of age. The females carry their babies for 10-11 months, and their babies nurse for 6 months much like humans. The females swim closer to the shore than the males. The minke’s travel in small groups or alone. They have complex family bonds, and communities. They speak a complex dialect and are famous for vocalizing the “boing”. Unfortunately for the minke whales of 2011, they are a target of commercial whaling, “Only in recent decades have minke whales been taken by whalers to any extent; they were thought to be too small to be a worthwhile catch. But as the larger whale species became depleted, the whalers began to hunt the minke as a replacement. 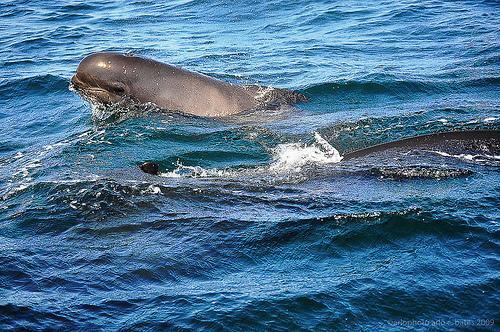 Since the late 1960s and 1970s, Japan, Russia (which has now ceased whaling), and (to some extent) Norway have focused their whaling efforts on minke whales”, “American Cetacean Society http://www.acsonline.org/factpack/MinkeWhale.htm. ” Because they had already driven the huge whales like the sperm whale to the brink of extinction, the whalers switched their focus to the smaller minke whale where it remains today. 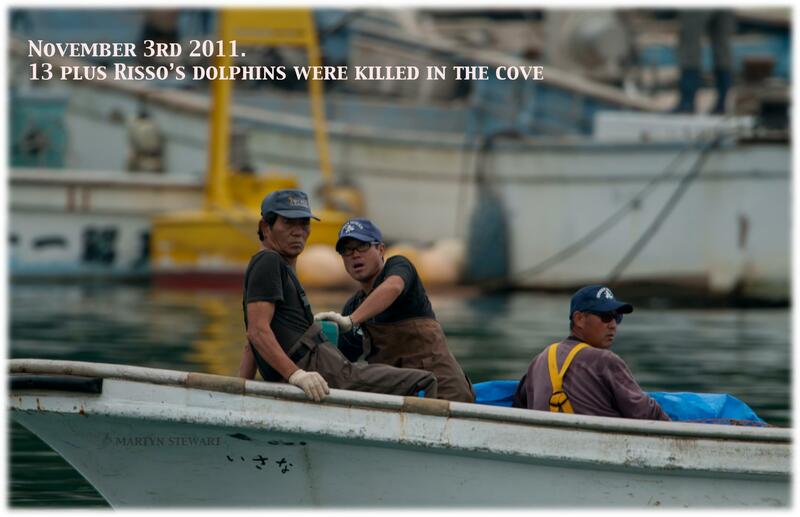 On April 26, 2011 three so called, “research” whaling ships left the ports of Kushiro and Hokkaido. The thirty member crew had received a permit to harvest sixty minke whales for research purposes. 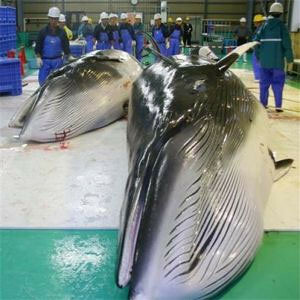 In the name of research the Japanese will end up with approximately six hundred tons of minke whale meat. This Minke Whale sashimi was slaughtered in the name of research. 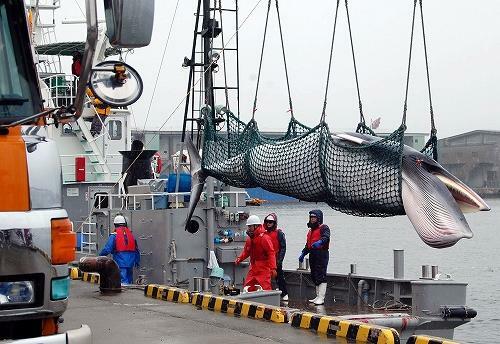 Until Japan voluntarily ends their insatiable desire for whale meat the minke whales future is bleak. 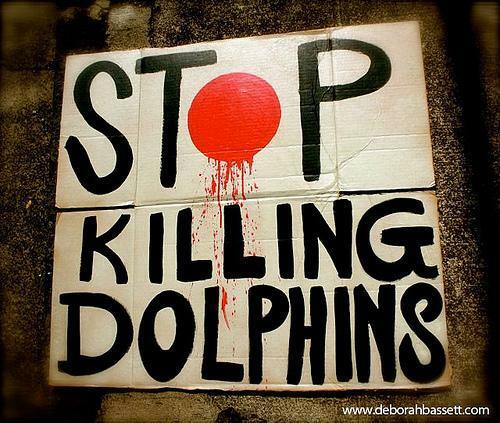 Contact the Japanese Embassy in Washington DC and urge them to stop killing whales and dolphins. Be polite, and urge them to protect Japanese consumers from mercury poisoning from eating dangerous whale and dolphin meat. Please Support the Sea Shepherds, The Cove Guardians, Save Japan Dolphins, and Wdsf/Prowal. Together we can make a difference. Springtime is upon us! Where ever we look there is new life. Spring brings most of us hope but not for the dolphins of Japan. 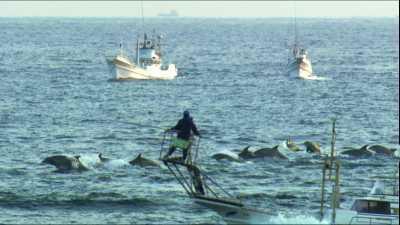 This morning the Japanese drove 75 Pilot Whales into the Cove. You can only imagine the fear these sentient beings must be feeling as they wait for the knives of the dishonorable Japanese Fishserman. Much like the victims of Auschwitz they must wait, and watch as their murders sharpen their knives and prepare for the massacre of these defenseless beings. They will begin the slaughter in 10 hours. The tarps are being spread for the massacre of an entire community of pilot whales. Mothers,babies, pregnant mothers, the Japanese just don’t care. Their lust for dolphin and whale meat is insatiable. Their capacity for cruelty endless. We cannot look away from this mass murder! The supporters of dolphins, and whales are growing everyday. We can stop this thing but we must take action! We need to deliver a strong message to the corrupt Japanese Government. Follow the Link below and tell Prime Minister Nato Kan the Japanese must stop killing and capturing dolphins. Let him know that until the killing stops we will boycott all things Japanese, we will not support or help them in anyway until they stop the mass murder of the people of the sea. Japans whaling efforts, at least for this year in the Antarctica, have ended. In this case, as has been reported throughout the internet, many factors are at play. Certainly, the efforts of the Sea Shepherds and Capt. Paul Watson, are responsible for pushing the entire issue to the public forefront. I find it most interesting that, “Whale Wars” hero, Captain Watson, lists his home port as Friday Harbor, Washington which in my mind is one of the worlds hot-spots for whaling issues and in particular killer whale research and watching. If you have not already found the Whale Museum and their web site, http://www.whale-museum.org/ it really keeps one current on the what is happening on cetaceans. I need a history lesson on how all this ties together, but Ken Balcomb the international recognized marine mammal expert, should also be mentioned for his significant contributions. Based on his efforts, Navy Sonar has come under close scrutiny which has resulted in a huge shift in public understanding of the dangers associated with the damaging effects it has on whales. Further his efforts to expose an equally devastating practice on marine species is the use of LIMPETS, also known as double hooked barbed darts used in tagging. We at Champions for Cetaceans have posted several blogs on these issues. While reading an excellent article that criticized whaling on “The Diplomat” called, “Why did Japan Suspend Whaling?” written by Andy Sharp, I came upon a great comment by the author Animux. What he said really sums up the issue on whaling and why the Japanese must stop now. “The world’s whaling industries drove nearly every large species of whale to the brink of extinction. As the public grew to learn more about whales in the 1960s and 70s, opposition to whaling took shape. What some people fail to mention, or understand, is that Japan has a long history of whaling regulatory violations dating back to the 1930s. 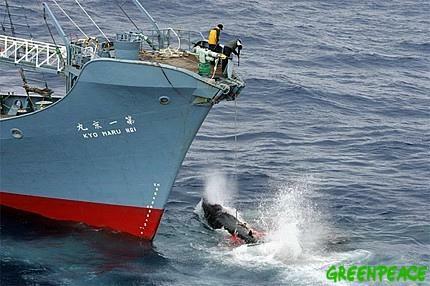 Japan has historically violated size limits, species protections, seasonal limits, sanctuary boundaries, all manner of quotas, and has even facilitated “pirate whaling” (that’s front companies with foreign labor illegally killing whales and smuggling the unreported meat to Japan). The current whaling operation is merely the latest incident in an established pattern of criminal behavior. Japan kills more whales than any other nation and acts as the world market for whale meat by importing endangered Fin whale from Iceland. The International Whaling Commission established a moratorium on all commercial whaling in 1986 and the Southern Ocean Whale Sanctuary in 1994. the IWC has also passed multiple resolutions calling on Japan to stop killing whales. However, Japan continues to abuse the “science loophole” of the ICRW (International Convention for the Regulation of Whaling) as justification for subverting the democratic decisions of the IWC. 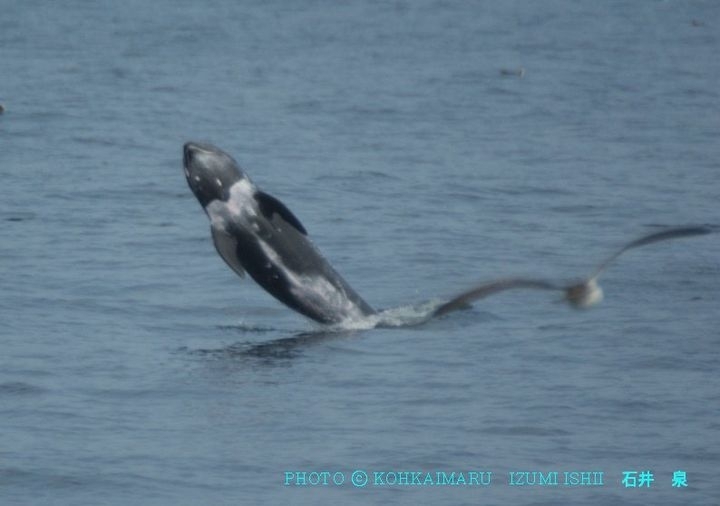 Japan annually kills endangered Sei and Fin whales, vulnerable Sperm whales, Bryde’s whales (listed as data deficient), common Minke whales (many from the vulnerable J-stock), and Antarctic Minke whales (listed as data deficient by the IUCN but some research implies this species may have suffered a significant decline). Also, coastal fishermen annually slaughter tens of thousands of dolphins for human consumption despite mercury contamination. Jun Morikawa, author of “Whaling in Japan”, has written that whale meat was only ever a “substitute meat” during the post WWII recovery. When the economy recovered, Japanese families purchased other meats (even when whale was significantly cheaper) and consumer demand for whale has consistently declined since the 1960s. 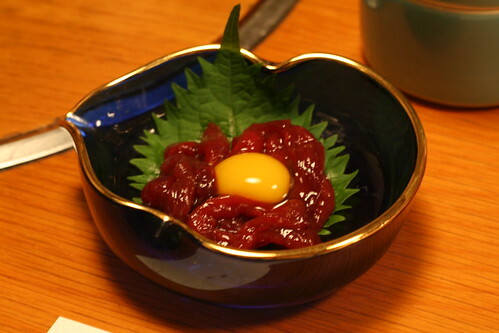 Today, only a tiny fraction of the Japanese population actually consumes whale meat. The historical tradition of killing and eating whales is limited to a small number of isolated coastal villages. In fact, in some regions of Japan whales were once worshiped and never eaten (an aspect of Japanese culture that is somehow overlooked in this conflict). Since the start of the 20th century, Japanese whalers have used Norwegian (not traditional) industrial whaling techniques and technology in order to maximize profits like any other modern industry. According to Morikawa, the whaling programs only continue in order to support entrenched bureaucrats (amakudari) who often leave their government jobs to take high paid positions in the commercial whaling industry they once oversaw, and secured tax-subsidized funding for, as public officials. Fisheries officials have publicly admitted the interference from Sea Shepherd has forcibly reduced the total catch for several years. In private (Wiki-leaked) discussions more officials have admitted Sea Shepherd interference has also increased domestic pressure on the government regarding whaling. However, other organizations have contributed to this effort. Greenpeace’s exposure of a whale meat embezzlement scandal certainly raised eyebrows and tempers within a Japanese public already fed up with government corruption. “The Cove” became a free speech issue within Japan when nationalist extremists used intimidation tactics to have the award winning documentary banned. The UK’s Sunday Times recently uncovered evidence of Japanese representatives bribing Caribbean officials for IWC votes in an undercover investigation.